With more than 8 million researchers around the world, continual developments in technology and increasing publication speeds, the volume of research being published continues to grow: Elsevier now publishes more than 350,000 articles every year. So much competition means it can be difficult for researchers to make their articles stand out and have an impact with the right readers. By presenting their work in different ways, researchers can help readers navigate the growing body of published articles and get their articles noticed. On the Content Innovation team at Elsevier, we use technology to enable authors to enhance their articles and present their work in a more information-rich and interactive way. One way we do this is by making plots and maps interactive and visualizing molecules in 3D. 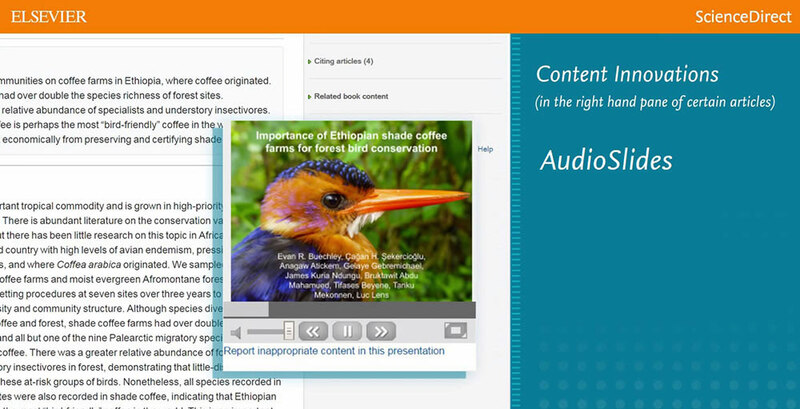 Another way is through AudioSlides, which lets authors to publish a short presentation with their article to tell the reader about their research in their own words. To help authors tell the story of their research, share its relevance with readers and reach a wider audience, we recently published a webinar on making the most of AudioSlides, along with a template presentation. When Dr. Tilbe Göksun, now Assistant Professor of Psychology at Koç University, Istanbul, created an AudioSlides presentation about her paper in Neuropsychologia, she found a new way to talk about her research. The format provides researchers with the opportunity to express the gist of their papers in an easily accessible way. The reader also gets a quick grasp about the paper that cannot be explained in a short written abstract. By embedding the video in personal research or lab websites, the findings in the paper can be reached by a broader audience. AudioSlides are short, webcast-style presentations. 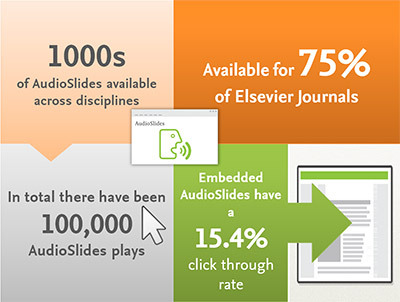 More than 75 percent of Elsevier’s journals – close to 1,500 titles – support AudioSlides. When an author creates an AudioSlides presentation, it is shown next to the article online. This means that people who are interested in an article can listen to the author explaining their research in an interesting, engaging, personal way, giving them a different perspective on it. There is a correlation between AudioSlides and article usage, with articles that have accompanying AudioSlides presentations being read more. We compared the usage (downloads and views) of a set of articles that have AudioSlides with similar articles that don’t, and found that the median usage of the articles with AudioSlides is up to 50 percent higher. While it’s difficult to show causation directly, we observed that this increase in usage is particularly strong when authors actively use their AudioSlides presentations to promote their work on other websites or social media. So the effort can really pay off! So far, AudioSlides presentations have clocked up more than 100,000 views; in addition to the thousands generated directly in the articles online, presentations that are uploaded to YouTube or embedded on institutional websites also encourage people to read the original articles. What’s more, when people see a page with an AudioSlides presentation online, more than 15 percent will watch the presentation. A great AudioSlides presentation introduces a paper in a simple way without compromising its scientific meaning. It explains to the audience why the research was done, what the main findings were, how they were reached, and what they mean for the reader. So who is that? An author’s colleagues, supervisors, professors and students might read their paper. Peers at other institutions also read the research, opening doors to new collaborations and projects. Family, friends, the media and many others may also be interested in the research, so communicating about it through a variety of channels can help make it accessible and available to a wider audiences. PhD student Thanh-Lan Gluckman of the Department of Zoology at the University of Cambridge found her AudioSlides presentation helpful when reaching out to the media about her work. “It was a great way to get the message across to busy professionals and the general public in five minutes and I could use pretty pictures to make it accessible,” she said. A visual presentation can help explain complex ideas, such as the implications of using rounded data at the wrong moments. When Phil Borman, QbD Lead Analytical in Product Development (R&D) at GSK, and his colleagues had the opportunity to produce an AudioSlides presentation on this topic, they first watched the AudioSlides webinar to get some tips. 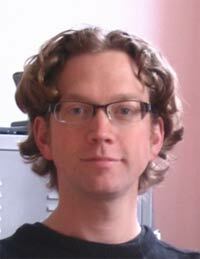 “We recently created a five-minute presentation which summarized our recent publication ‘Avoid the perils of using rounded data’ and used a lot of the advice the AudioSlides online lecture gave in trying to tell a compelling story around the key messages we detailed in our paper,” he explained. While some of the most successful AudioSlides presentations feature images and illustrations, an author doesn’t need to be a great photographer or illustrator to create a strong presentation. With AudioSlides, authors either want to give readers an understanding of what their main findings were and what they means, or get other researchers and even the public interested in reading more about their work; images can help them do this. Well presented, AudioSlides can spark curiosity about research and help maximize the impact of an article, and we hope our new materials will help even more authors make the most of this. So what does an AudioSlides presentation look like? Here is a presentation that explains why it is sometimes risky to use rounded data in calculations and visualizations, illustrating what can go wrong. Want to find out more? You can watch the presentation below or on YouTube. Use the template deck to guide the content. Make the importance and relevance of the work clear upfront, putting it in context. Tell the story using simple language: this could help researchers from other disciplines understand the article. Break the story down into sections: summarize the findings, then talk about background, methods, results, conclusions and future work. AudioSlides presentations can be up to 5 minutes long, so keep it short and simple. Prepare the slides in advance. Practice the script and find a quiet place to record. Check the presentation before publishing. Upload the presentation to YouTube and share the link across social media. Watch your article’s downloads clock up! 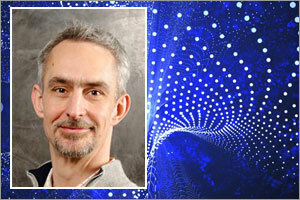 Dr. Hylke Koers is the Head of Content Innovation at Elsevier, leading a team that is responsible for enhancing the online article format to better capture and present modern-day research. 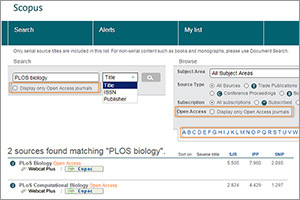 Part of Elsevier's Article of the Future program, this includes improved online presentation as well as in-article visualization of digital research output – for example through interactive plots, 3D viewers, or the award-winning Virtual Microscope. Pilar Cos Alvarez is a Content Innovation Manager at Elsevier responsible for projects such as Audioslides and Cytoscape, among others. She joined Elsevier in 2013 as a Project Manager for the Publishing Services department. She holds Msc in Fundamental Physics from the University of Cantabria in Spain and gained some research experience at the Institute Laue Langevin. 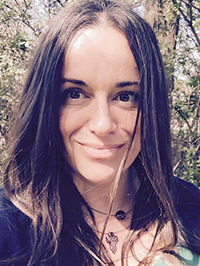 Kitty van Hensbergen is a Project Manager in the Marketing Communications & Researcher Engagement department at Elsevier and is responsible for global projects. She has an MSc degree in economics and business, specializing in marketing, from Erasmus University Rotterdam. She is based in Amsterdam.